I shamelessly asked a friend to get some makeup goodies for me on her recent trip to America. Luckily the task at hand involves shopping so it wasn't the worst favour of all. It's amazing how a kind soul would offer their holiday time in going through my list! It is mind blowing. I was most excited about the lipsticks! Surprise, Surprise. It is the Maybelline Creamy Matte range that is still yet to come out in Australia. It's been raved in the Beauty community and waiting is no longer an option for me. I had one of those I.need.it.in.my.life moment of insanity when I created my list. 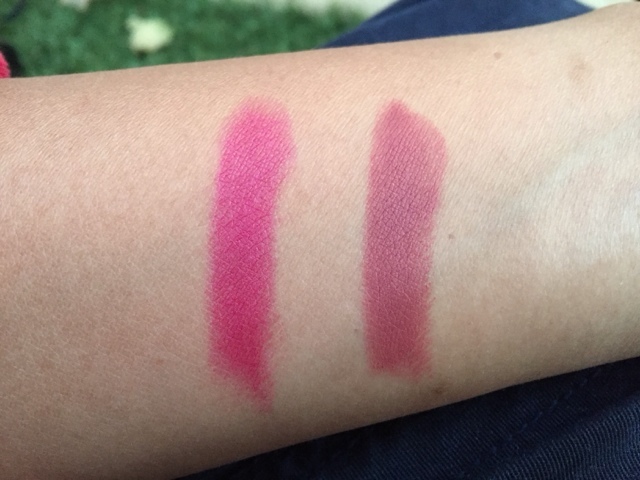 Luckily, my friend managed to get 2 shades, Mesmerizing Magenta and Touch of Spice, both are equally beautiful! The creaminess of this product is superb that you too, my darling Aussie readers, need them in your lives. Second most wanted in my list was the Tarte blush in Natural Beauty. Coveted for months and it's finally here in the flesh and oh boy it did not disappoint. It looks like in your face kind of bright but not at all on the cheeks. It creates this soft rose flush, however, a light hand application is still recommended as you can easily go cray and clown cheeks are no longer trending. I've left the foundations to try closer to Spring time so if it's any good, hopefully it's available in our stores by then. The Anastasia brush had a minor injury (after the photoshoot) and it's unlikely to survive unless I superglue the heck of it so we shall see. It has a lot of promise because the bristles are sturdy and I can only imagine how wonderful it is to draw my brows. Hopefully I can resurrect it. And on to a little bit different but equally interesting online purchase - BAGS! I had this black quilted bag with silver chain straps - a Chanel wannabe. I had it for years and then it died so a visit to Charles & Keith website was a must. It's my favourite place to shop for a well made faux leather bags and they make pieces that are inspired by the high-end brands. The Mesh Crossbody bag is an inspired version of the Chanel Boy bag, very boxy and structured kind of bag with part faux leather, part chain straps. It's all black and classic and would be great on everything in my wardrobe. While the Bow Crossbody bag is a more fun and most likely to be the new night out bag. How cute is that bow though right? It's a Kate Spade inspired bag and possibly my favourite if you twist me arm. I think these bags are really well made and has really impressed me. It will serve my bag cravings for now until I get the real deal. Charles & Keith ships to Australia and they do carry so many cute bags and shoes. I am currently lusting on a Ghillie Ballerina flats - Link! - which is very similar to the TopShop Kingdom Ghillies - Link! Yes, another bloody pair of shoes. Houston I have a problem. Oh well that's it for now I think and I hope you all have a lovely day. Right now it's time for Blacklist, good ol' Netflix eh? PS. Thank you Mrs N for doing the US shopping for me! !